Tenshyuk ([Tib. བརྟན་བཞུགས་, Wyl. brtan bzhugs) literally 'stable remaining' is a long life practice which involves making offerings to a teacher and requesting him to remain long in this world for the benefit of beings. It can be quite a simple practice during which we offer representations of enlightened body, speech and mind (possibly with the addition of qualities and activity), for the sake of tendrel, and request the teacher to remain by reciting prayers for his long life. 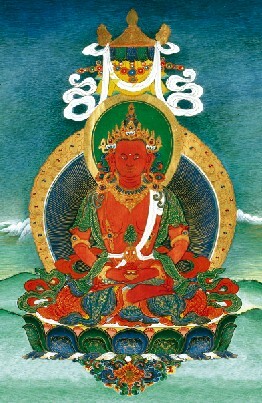 When done elaborately, it can include a practice called khandröi sundok, or ‘turning back the summons of the dakinis’, during which offerings are made to the dakinis of the five families in order to dispel obstacles to the life of the master. For several years now, following the advice of His Holiness Sakya Trizin, the Rigpa Sangha have been performing regular tenshyuk ceremonies for Sogyal Rinpoche. This page was last edited on 23 May 2018, at 20:00.